Plus further 15% discount for Missy Readers! Don't miss this huge beauty products clearance. Stock up on your favourite cosmetics brands. Leading designer cosmetics fragrances, skin care and much, much more! 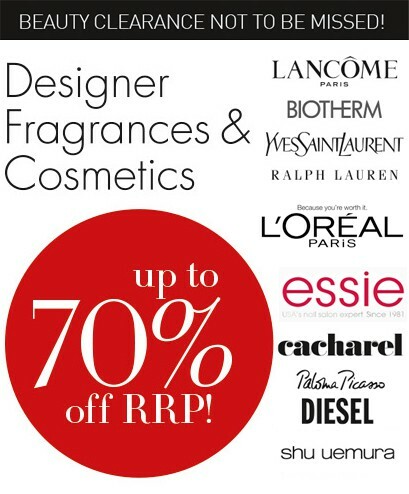 Major designer and commercial cosmetics brands and fragrances all on sale with huge reductions off retail price. Wed 19th - Sun 23rd November. Fantastic savings on L’Oréal brands! Huge Selection of Active Cosmetics, Luxe, Consumer and Professional Products. Cash, EFTPOS, Mastercard, Visa, Sorry, no AMEX, no DINERS no CHEQUES. Mention 'Missy' (or show flyer on your phone) for a further 15% off sale prices!